Even though the subject of onboarding is well-developed by corporate blog researches like Totango, more in-depth view by Harvard Business Review and by multiple other resources, the exact time when it starts remains disputable. Some companies think customer onboarding starts from a welcome email, while another popular thought is that it starts with that very first step of signing up for the service. The other contradictions refer to the time when it actually ends, which strategies to follow, what content to use and how often should companies change their onboarding. On the other hand, the researchers who dig deep into customer onboarding agree that it is an ongoing process encouraging customers use your product and get value from it. Let’s take a look at where it all begins for a startup. You have done a great job with your product or service, spent hundreds of hours developing, testing and retesting something people will soon recognize as the next big thing. Then, you have scheduled your release date and got your first users. The moment of truth, here comes the recognition and appreciation of your hard work. But wait, the users are leaving, they fail to convert the way you’ve expected. You open your analytics tool and try to find what could go wrong. This is the moment most startups, who are unaware of the impact onboarding makes, would start their research, read success stories and startup journeys and soon they will find that the answer was so simple and both conversion and retention could be improved with customer onboarding done right. Onboarding as any other process requires preparation. If you don’t know where to start – start with your competitors. There will be at least a couple of companies who have already done their onboarding. Now, it’s your job to analyze what best practices you can learn from them. Our startup Chanty, as a Slack alternative, knew how eye-catching, engaging and simple the onboarding could be once we analyzed the onboarding of our competitors. Fortunately, there are so many great articles on how to make every bit of customer onboarding work for your startup industry your startup is in that it’s only up to you to take advantage of that knowledge. You are not entering an existing market and up to creating a new one? No worries, there are still great examples of onboarding from the top software companies. You can start with these ten examples analyzed in the Groove blog article. With resources like UserOnboard you can feel safe and sleep well at night. They’ve done a hell of a job preparing a teardown of 50+ products and services for you to watch and learn. Companies like Smartscreen and Process Street will help you to come up with a checklist for your onboarding. You will find an example of well-written emails in the Customer.io blog article and get inspired by the examples provided by another valuable article by Groove. The power of testing your onboarding is covered in this CXL article. Finally, the whole process is covered in details by Appcues with eight categories and about a hundred of articles explaining everything it takes to make an amazing onboarding for your company. The next part in your onboarding process is finding the “aha! moment”. Twitter, Facebook, LinkedIn, Dropbox have their “aha! moments” described in article by Richard Price. 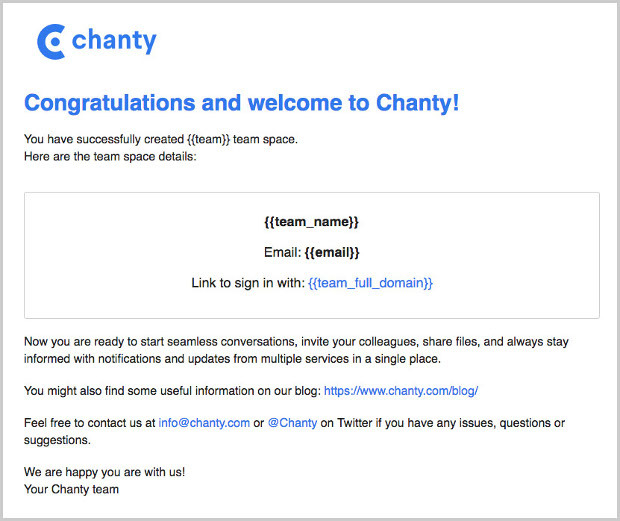 For Chanty in the beta stage it is the amount of users who choose a conversation they want to start on welcome screen where we explain the value of the private and public conversations and mention notifications as an important part of every Slack alternative messenger app. While in beta, test the concepts you are going to deliver once the product is released. If you have already passed the release stage – consider the amount of users who are engaged with the part of your product that delivers maximum value for your customers. Remember that even the most elaborate and well-designed onboarding can’t remain unchanged as time goes by. The new trends appear every year if not every couple of months, new users realize they have the need for your product or service and in order to react to those changes you need a lot of testing and information to analyze why people churn and how you can make them even more satisfied with your product. There are success stories from the companies who increased their conversion rate by 17% and even more. They did it because they constantly experimented and found the most effective option to improve user onboarding. You have to work hard to get people sign up for your product or service and then even harder to make them stay with you. Take the time to understand that a new user won’t probably know how to navigate and get the most from your product. That is why your job is to create the onboarding flow to demonstrate the value your product delivers and encourage them to use the interface the way you want them to. The sooner you realize the end is just the new beginning the better results you will reach by testing, optimizing and improving your onboarding.